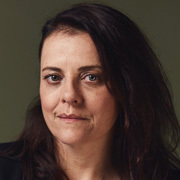 Katie Wolfe was born in New Plymouth in 1968 — a descendent of Ngāti Tama/Ngāti Mutunga on her maternal side, and the daughter of an All Black (Neil Wolfe). As a 14-year-old she made her first stage appearance in the supporting cast of Annie, performed by the local operatic society. Further appearances followed; she later said "If I've ever had a feeling of coming home that was it. It just felt right." In 1986 Wolfe enrolled at Victoria University in Wellington and graduated with a BA in English, having spent "most of my time in the drama department". Determined to become an actor, she auditioned successfully for Toi Whakaari. She graduated in 1990. Her first fulltime professional acting job followed, earning $199 a week at Dunedin's Fortune Theatre. So did her first taste of television — as a presenter on several episodes of popular children's nature series Wild Track. Her screen acting break followed shortly afterwards. Onetime actor Ginette McDonald, in Dunedin visiting writer Robert Lord, recommended she audition for a part-Maori role on Marlin Bay, the first primetime drama series to be made by Auckland's South Pacific Pictures. Three years of playing the feisty Ginny Galloway followed. Wolfe says that it was here she learnt her screen acting craft, alongside Andy Anderson and Ilona Rogers. Wolfe made her big screen debut in movie The Last Tattoo, played the missing girlfriend of a GI in the WWII-era drama. The role had a lasting effect: within six months she was married to fellow cast member, former classmate Tim Balme. Her next television appearance was on Cover Story, as hard-bitten, chainsmoking star journalist Amanda Robbins. It was a step up from what she called the 'teenage angst' of her Marlin Bay role; she admired her character's intelligence, abrasiveness and determination to get the story. Wolfe won Best Actress at the 1997 Television Awards for her work on Cover Story's second season. As well as two major television series she found other outlets for her talent. She appeared in short films: Grant LaHood's Lemming Aid, a double role in Andrew Bancroft's Cannes Critic Week-winning Planet Man (alongside her husband), and La Vie en Rose — written by Anna Reeves, a friend from New Plymouth. Continuing her stage career, Wolfe formed Tasman Ray Productions with Balme. After the success of debut show Blue Sky Boys they toured Balme's solo show The Ballad of Jimmy Costello; it was while the couple were in Dunedin contemplating a meagre profit of $200 and a $120 speeding fine that she was asked by Simon Bennett to join the cast on Shortland Street. She played Doctor Bridget Armstrong — a bright but chaotic locum who was the 'homewrecker' getting between Peter Elliott's David Kearney and Robyn Malcolm's Ellen Crozier. The episode where the two finally got together eclipsed Holmes in the ratings. Appearances in drama series Duggan and in Glenn Standring's film The Irrefutable Truth about Demons provided an antidote to 18 months on Shortland Street, but an ill-fated theatre venture was a reality check. In 2000 Wolfe, Balme, Robyn Malcolm and Simon Bennett formed the New Zealand Actors Company; but, after two successful productions, the failure of the third saw the curtain close. Wolfe, who had given birth to her first child and continued to appea in Mercy Peak, was now finding growing disillusioned with acting after a decade of constant activity on stage and screen. Working on Shortland Street with Bennett had given her the opportunity to more closely observe the craft of directing; she liked what she saw. She applied for a trainee's position on Shortland Street. Thrown in the deep end, Wolfe knew she was in the right place. By 2003 she was directing episodes of Shortland, and would go on to produce on the show as well. Wolfe continued her association with the stage but tried to limit herself to a production every two years. Her role was changing there as well. In 2005 she won Most Promising New Director at the Chapman Tripp Theatre Awards. Wolfe was also becoming more aware of her Māori heritage. Directing for Māori Television underscored her lack of fluency in the language. Over the next years she juggled a second child with te reo classes, and then a full immersion course. She went on to direct Māori language shows Pūkoro, Korero Mai and Whānau. There was also another project — directing her first short film. A black comedy about the bitter after-taste of love, This Is Her was initially written in an evening by Shortland Street scribe Kate McDermott. The film required nine locations and 13 characters — three of them children. The finished film played at festivals around the world, including Sundance, Edinburgh, Aspen (Best Comedy), Palm Springs (Future Filmmaker award) and Prague (Audience Award). It won the prize for Best Short Film at the 2008 NZ International Film Festival, and was a finalist in all four short film categories at the 2008 Qantas Film and TV Awards. In 2010 Wolfe directed her second short, coming of age story Redemption. She also co-wrote it with Balme and Renae Maihi, working from a short story by Phil Kanawa. Wolfe called it "my first Māori film", adding that "the connection I have to the material has been with me many years." Wolfe's first feature length project as director was a tele-movie adaptation of Witi Ihimaera's book Nights in the Gardens Of Spain (aka Kawa), which debuted in January 2011. Wolfe was already familiar with this tale of a married man revealing his homosexuality before being approached to direct the script, which was written by Ihimaera and This is Her's McDermott. Said Wolfe: "Witi's book was an amazing story, and it was a great opportunity." In 2017 Wolfe joined the team of all female directors and writers behind anthology feature Waru.